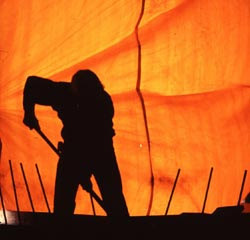 Like most people, you may assume that the technology that goes into tarpaulins has been the same for thousands of years, that tarps were perfected, hook line and sinker, way back when someone first hung a bear skin over a couple of sticks. Well, like most people, you would be wrong. If you want to look at the cutting edge of modern technology look no farther than the tarp. The most recent new development in the tarp community would be the polypropylene tarp, or as they're more commonly called in the tarp world, simply "poly" tarpaulins (don't worry, other tarp enthusiasts will know what you're talking about). Not a traditional fabric, but a "laminate", polypropylene can last for years on end while providing protection from harsh elements. There is, of course, a difference between traditional, "Old School" polypropylene and UV treated polypropylene tarps. UV treated tarpaulins are not your grandfather's tarpaulins, that's for sure. An untreated tarp will quickly become brittle and nigh unusable upon exposure to the sun, whereas a UV treated rig may last decades. Another development that's all the rage amongst tarp lovers: The perforated tarp. You may be asking "What good is a perforated tarp?! How's THAT gonna block the rain!?" Well here's the twist: It's not for the rain! The perforated tarp generally serves one of two purposes, either protecting the side of a building, or for advertising. The benefit of perforated sheets would be the lack of wind resistance, allowing wind to blow freely through without whipping it around like a... Whip. So if we've made one thing clear, it should be this: The next time you look at a tarp, don't just think of it as some boring old tarpaulin, think for a moment, if you will, of the technology and research that went into creating it. The common user of the tarp may only think of it as simple protection from wind and rain, but the true tarpaulin buffs out there know it to be much, much more. I know that when we got our tarp it helped us out. Great job.